Los Angeles based artist Gary Villarreal, invites you to immerse yourself into his world. A world made of extraordinary creatures, meticulous brushstrokes and intricate short stories. 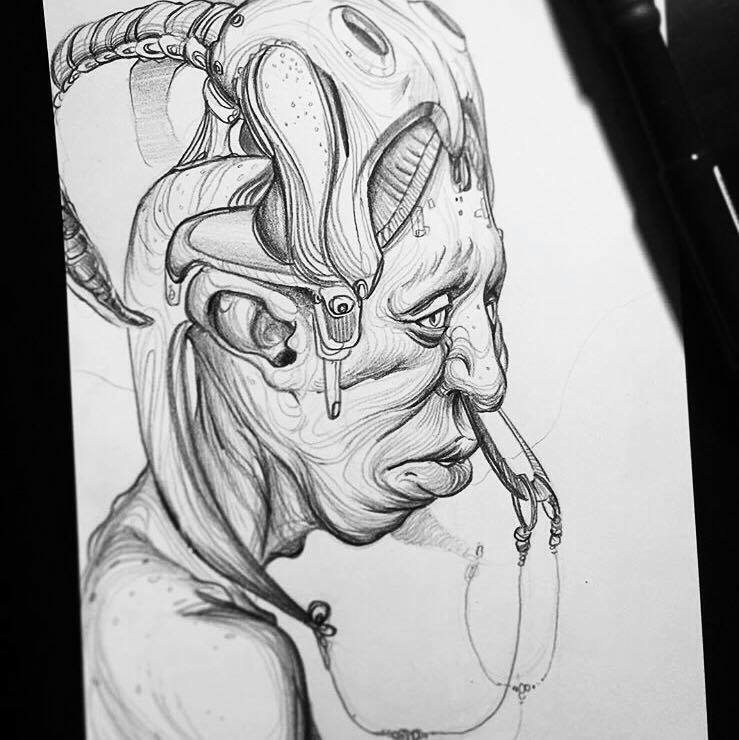 Villarreal is a concept artist and illustrator who shares most of his sketches on Instagram. He is highly active on the platform, always interacting with the artist’s community, sharing other people’s work and striving to inspire whoever stumbles upon his account. Hey Gary! Thank you so much for being so responsive and down for this interview. When I first found your Instagram account I was completely fascinated with your drawings and the amount of detail they have. Tell us a little bit more about your background – where are you originally from and how did you start your career as an artist? VILLARREAL – First of all, thank you for diggin my work! I’m originally from a small country town in Texas. I drew a lot as a child quite similar to any other artist in world, but I think what really drove me to draw more was having older siblings that drew too. I would copy the things they drew. They were always supportive and I guess that’s what nurtured that creative seed in me. My vision in becoming an artist was always blurry and always a rollercoaster ride. I do remember taking art very serious during my senior year in college, and it all clicked when I quit my day job and went freelance as a Concept artist. This might have been the best decision of my life. Walk us through your creative process – how do you bring your characters to life? Where do they come from? They seem to have different personalities and real feelings. VILLARREAL – I find my inspiration by questioning everything I see. Why do plants need dirt to grow? Why couldn’t they exist on a cloud? I remember a teacher telling our class that there’s no dumb question… funny how it all connected for me 15 years later. I also find small spurts of inspiration through out my day and it’s quite interesting to see how you find more creative things when you’re doing other things. For example, I might be washing dishes at home and all of the sudden a weird character pops in mind… So, I think tapping into your subconscious mind is the key to creating original content. I noticed you usually add short stories to your drawings and they seem to be a key element of the drawing itself. Do you develop the stories behind each drawing before or after you finish them? VILLARREAL – I draw first and type after. I’m a horrible writer to begin with, so I try to make things easier for me to prevent myself from getting discouraged. I don’t care if the story takes me an 30 min or an hour, I’ll still have something to accompany my drawings. I also noticed that you are constantly encouraging your followers (exactly 33.4 K, congrats!!) to come up with their own stories for your drawings. Your fans slowly become part of your work and that’s something unusual. Do you think this interaction you seem to be seeking with people in the community is something you wish to see more of among artists or something you wished more artists would do? VILLARREAL – People will hate me for saying this, but I don’t like seeing artists waste their beautiful minds full of creativity on Fan art. Fan art isn’t bad to develop your technical skills, but I feel like people do it to gain fame faster. They know that people will recognize a Spider man or a Street fighter, and if done perfectly, then you just hit a jackpot. However, I encourage my followers to come up with their own characters, stories, etc. Who cares if people won’t like the design? You are unknowingly contributing to new things that can lead to the next Spider Man. Dan Luvisi, one artist that I admire, created his own world and it’s a damn cool one too. So, I push artists to get out of their comfort zone and fail to later succeed. As for the community… it’s all about tough love and growing as an artist. We as artists struggle daily. I just want to let people know that it takes time and to fight through the struggle. Do you have any big plans for the near future? Or any big dreams – maybe an exhibition, a collaboration with an artist you are a fan of, or a trip somewhere?